Atlantik Surf can help you organize your accommodation in Puerto de la Cruz cooperating with a local travel agency (Viajes Santa Lucia) which will find the best accommodation options according to your budget. This option is available only for people over 18 years (or minors accompanied by parents or legal guardians). We suggest our students to arrive in Puerto de la Cruz between Friday and Sunday afternoon to start lessons on Monday as a group (we are flexible, you can start any day of the week because we offer surfing lessons in small groups and it allows us to teach individually any day of the week). Lessons are usually taught always on weekdays and on weekends only with a minimum of students enrolled. Our surf school is mobile, so do not forget that transport is included from any hotel in Puerto de la Cruz, bus station or other meeting points in town. 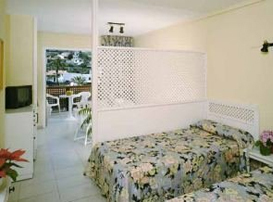 Usually, accommodation in 2 and 3 keys’ apartments located in Puerto de la Cruz will be offered. 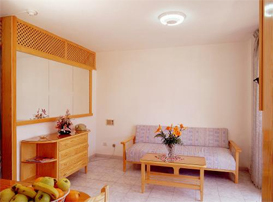 There are apartments/studios fully equipped with two beds, kitchen and living room. from 29 € / night in twin apartment. from 31 € / night in twin apartment. from 28 € / night in a single apartment. APARTAMENTOS PEZ AZUL, APARTAMENTOS FLORIDA PLAZA, APARTAMENTOS BELLAVISTA AND APARTAMENTOS TENEGUIA. Rates can change by season and availability, therefore we recommend our students to ask for a budget as soon as they know their arrival and departure dates and also any preferences to send them a budget according with their expectations. We will email with the available options and budget. It is possible to request a quote for more economical accommodation and also with upper category in Puerto de la Cruz and other towns of the island. You can also request a quote for a triple or quadruple apartment.